Old wooden canoes are rarely discarded. They end up in the attic of a garage or barn in various stages of disrepair. The canvas is usually gone, there may be broken ribs and rotted or broken gunwales, rotted stem ends and broken planking. The cedar ribs and planking can be broken, but hardly ever rotted. I try to preserve as much of the original canoe as possible, often scarfing new tips on gunwales or stems if the rest is solid. I try not to overdo finishing. I strip and clean the old surface and then varnish. 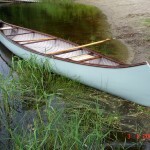 An old canoe should show its wrinkles and warts. The process includes steam bending of ribs, stems, gunwale ends and usually decks. I do all the work including canvassing & filling, caning of seats, hand painting and varnishing. Actually, I prefer “basket cases”, to a point, if it’s a rare old canoe. It is sometimes difficult to deliberate on whether to repair or replace. 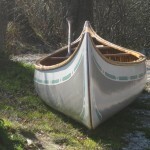 All-wood canoes are my preference even though they might leak a little bit until they swell. They are lighter, taut and responsive, mostly all natural and just prettier in the water.